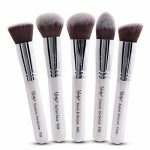 Vegan and cruelty-free makeup brushes and tools. All of the makeup brushes, tools and related accessories on our site are 100% free of animal-derived materials and by-products. 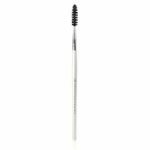 What are “vegan” makeup/cosmetics brushes? The term ‘vegan’ with regard to makeup/cosmetics brushes, simply refers to brushes that are made with any variety of man-made synthetic fibres, rather than with animal fur or hair. 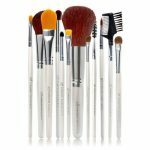 Why should I buy vegan makeup brushes and tools? It's important to mention that the old adage that synthetic brushes are only good for liquid and cream products simply isn’t true anymore. The technology behind these fibres has come a long, long way. What are vegan makeup brushes made of? What are “natural”, non-vegan makeup brushes made of? 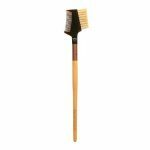 The bristles in many makeup/cosmetics brushes originally belonged to goats, squirrels, minks, badgers, sables, boars, horses, or other animals. Can natural makeup brushes be ‘cruelty-free’? Many companies use a variety of terms such as “Ethically Sourced”, “Cruelty-Free” or “Origin Assured” to claim that the animal fur or hair used for their makeup brushes is sourced or harvested without cruelty to animals. Unfortunately, these terms are not regulated by law, so companies are free to use them in any manner they see fit, such as misleading consumers into believing that they’re buying products that in no way caused harm to animals. The sad truth is, that brushes with bristles from minks, sables, or squirrels are products of the cruel fur industry. Every year, millions of fur-bearing animals are bred and raised on squalid factory farms, where they suffer miserably before they are brutally killed for their fur. Horse and goat hair is no better; it’s commonly obtained from horses and goats who are slaughtered for their flesh. Some may think that the hair would just be going to waste anyways, so it may as well be used, but in reality, any by-product sold from the slaughter of animals makes that slaughter more profitable, which make it easier to continue. If you’re truly concerned about ensuring your makeup brushes are cruelty-free, your safest bet is to buy synthetic brushes. What companies make vegan makeup brushes and tools? Please Note: This list does not contain companies that also sell ‘natural’ makeup brushes in addition to synthetic brushes. The companies above strictly sell vegan brushes. How do you choose which vegan makeup brushes put in this store? Quite simply, we maintain a growing list of companies that produce makeup brushes that are reported to be vegan and animal-friendly. We contact all of these companies to find out straight from them if they use only synthetic materials in their brushes. 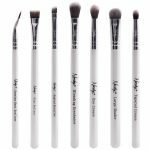 If they only use synthetic materials, and their brushes are sold on Amazon, we list them here for your shopping convenience. If you make vegan makeup brushes, or any other vegan/cruelty-free product for that matter, we’d love to feature you and your products on the “Brands We Love” section of our site! Contact us at - info(at)getitvegan(dot)com - to get started!